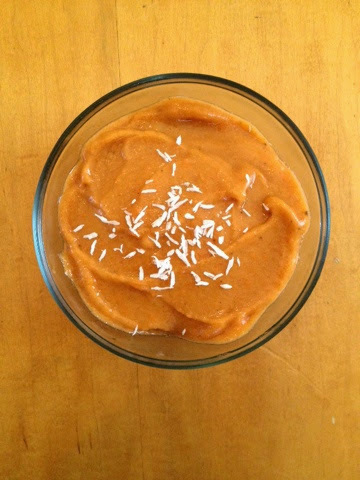 3 Ingredient Grain Free (PROTEIN!) Pancakes. So funny story. Well, not really funny, but...kind of hehe. I sorta blew up my oven last night. It was pretty bad. With my cookbook in the works I've been doing LOTS of recipe testing every day (at every meal! )...basically means my poor little oven has been working MUCH harder than normal. I usually am not a baker, and it's not uncommon for me to go weeks without even turning my oven on! But with the cookbook writing prep, all that has changed. Anyway, back to my story. I was planning on making...something yummy (I can't give it away yet! They will be in my cookbook...!) in the oven. However. With last night's mini fiasco, that plan was, well, terminated. And then these not-so-beauties were born. Don't let their humble (um, Anna...try UGLY) appearance scare you off. These. Things. Are. Amazing. Definitely a new favorite of mine! 3 Ingredient Grain Free (HIGH PROTEIN!) Pancakes. 3 Ingredient Grain Free (HIGH PROTEIN!) Pancakes; Vegan, Gluten-free. Serves one (makes 3 small-medium pancakes). 1. Heat a nonstick pan/skillet over the stove. 2. Combine mashed nana and protein powder and mix well. Add 1 tsp water and mix again. Add flax and stir ver very well. The "batter" will be thick and VERY sticky. Don't let that scare you. 3. Spoon about 1/4 cup of batter onto heated pan and spread around to form a circle. These cook FAST. Cook about 1 minute, flip, cook one minute. Repeat for 3 cakes. Too as desired or eat as is! Yummy both ways. NOTE: Protein powders vary in texture and consistency quite drastically. If you use a brand other than Vega I can't guarantee the outcome will react like mine. 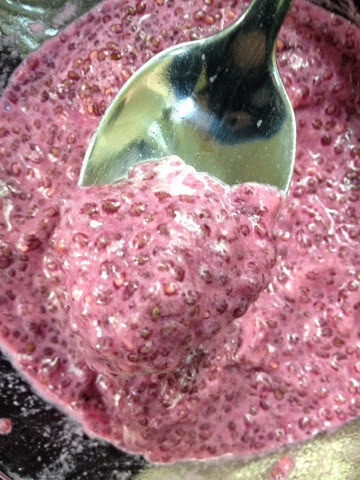 My favorite chia pudding: Coconut-Beetroot Chia Pudding. I love chia pudding. I love chia seeds in general! I mean, what's NOT to love?! A mere 1/4 cup provides 6 grams of protein, 11 grams of healthy fats (HELLO OMEGA 3's! ), and only 180 calories. I thought I had died and gone to vegan foodie heaven when I learned of all the incredible uses of chia seeds. ESPECIALLY when I discovered my beloved chia pudding. Chia puddings are definitely a go-to quick breakfast for me. Chia gives me so much energy-perfect to power me through a run or skate! This particular chia pudding is definitely a new fave. Beets (another of my favorite things!) and coconut go great together, if you're never tried that combo. Quick, easy, ridiculously filling. What are you waiting for?! Coconut-Beetroot Chia Pudding; Vegan, Gluten-free. Serves one. 1. Place chia in a LARGE bowl (do not underestimate bowl size...this expands drastically!). 2. 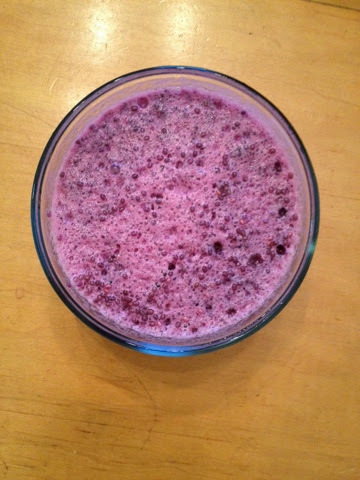 In vitamix or other high speed blender, combine beets, almond milk, and stevia. Blend until smooth. Pour over chia and stir with spoon. 3. Cover and place in fridge overnight. When ready to eat, garnish with shredded coconut if desired. Enjoy! You will..! 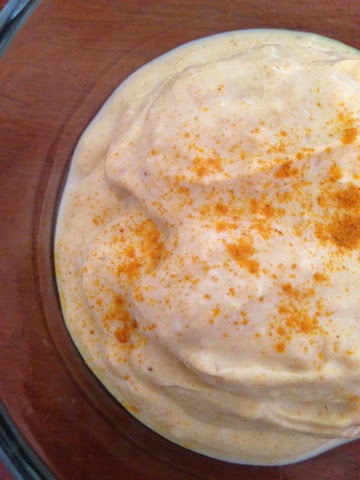 World's Creamiest Hummus: Spicy Chipotle Plantain Hummus. Before you go running away (yes, this is quite a strange combo...), hear me out. Hummus is good. Plantains are good. Spicy is good. Combine them all?! Yummmmmmoooooo. 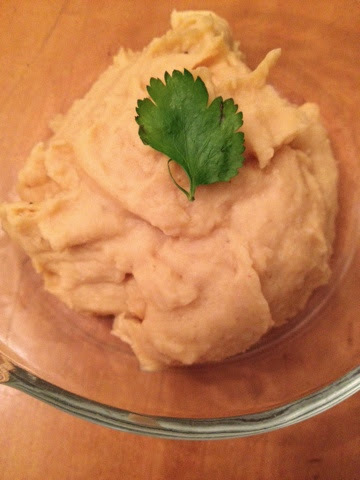 And yes-my secret ingredient for lusciously creamy hummus is none other than the glorious plantain. I LOVE plantains. So incredibly versatile, nutritious, and yummy. 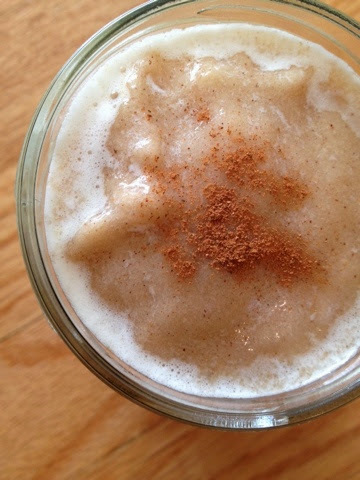 When blended, plantains get ridiculously creamy and smooth. Give this hummus a go--you'll be glad you did! 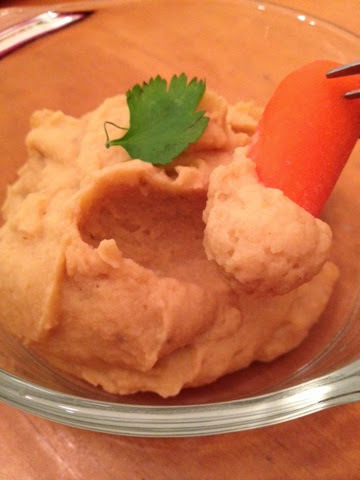 Spicy Chipotle Plantain Hummus; Vegan, Gluten-free. Serves one. 1. Combine all ingredients (EXCEPT cilantro) in your mini food processor and blend until super smooth. I added about 1 T water to get things moving. Serve into bowl and garnish with cilantro. 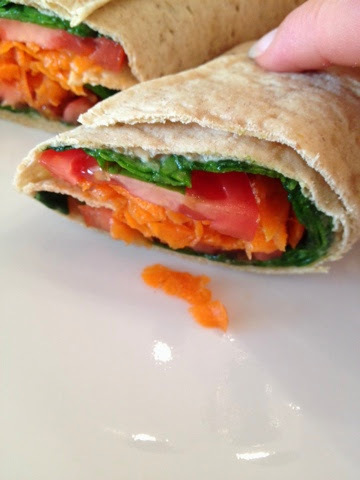 Enjoy with raw veggies, pita chips, or tortillas. Carob Pancakes with Peanut Butter and Sweet Cherries. 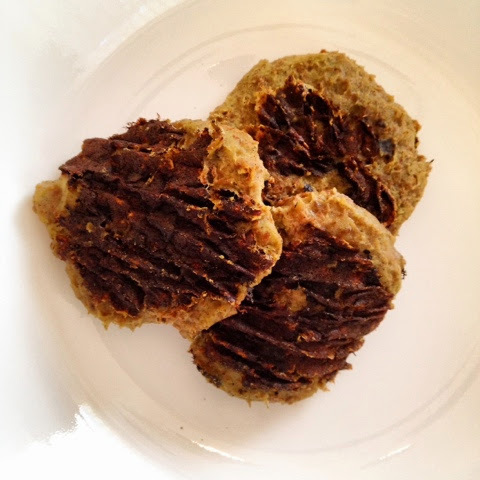 Carob Pancakes with Peanut Butter and Sweet Cherries; Vegan, Gluten-free. Serves one (3 smallish pancakes). 1. 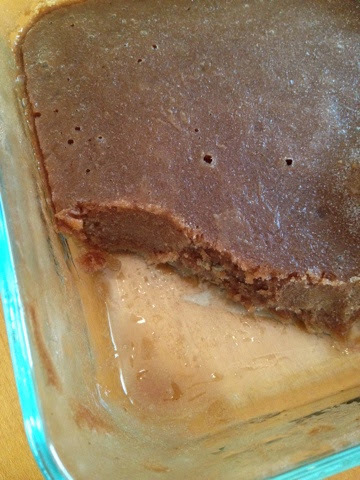 In medium size bowl, combine flour, baking powder, stevia, and carob. Whisk well to remove any clumps and add water. Stir well. 2. Cook in nonstick pan over medium heat, about 3 minutes per side or until edges look browned and insides begun to bubble. Flip and cook 3 more minutes (approximately). Repeat! 3. Once all pancakes are cooked, arrange on a plate. Take largest cake, spread with peanut butter, and place a couple cherries on top. Slightly mash down with back of spoon and place next largest pancake in top. Repeat until you get to the last cake. 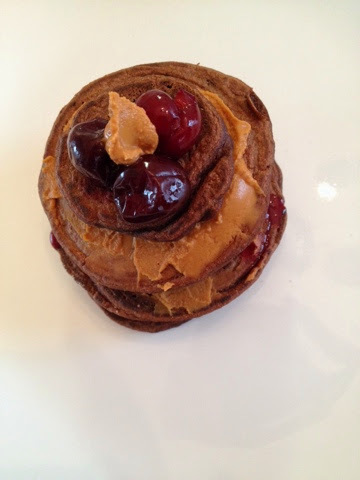 Top with a few cherries and a dollop of PB. Enjoy! Ok. This doesn't really need an introduction because the title says it all. Carrot. Cake. Nice. Cream. Oh yeah-I went there. Smooth, creamy, deliciously cold, and sooooooo healthy. Think it's too good to be true? You should know me better than that by now...! Carrot Cake Nice Cream, pre garnish. Carrot Cake Nice Cream; Vegan, Gluten-free. Serves one. 1. Steam your carrots. I did this in the microwave, but you can also boil them in water in the stovetop until tender. Once easily pierced with fork, rinse in strainer under cold water for about 30 seconds. Pat dry and set aside. 2. Combine all ingredients( plus a SPLASH of water) except coconut in vitamix or other high speed blender and blend until super smooth and creamy. 3. Spread into bowl, cover, and freeze about 30 minutes. Too with coconut before serving, if desired. Enjoy! 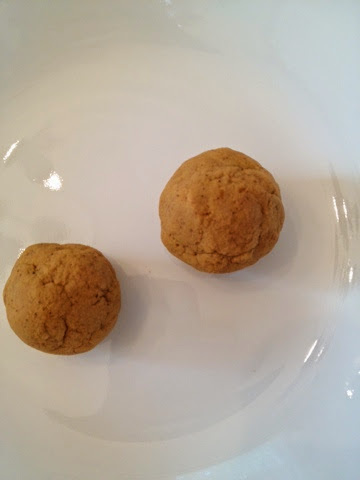 Sunwarrior Protein Powder Review and Protein Power Balls. As you can imagine, I'm a pretty frequent flyer at my local health food store. It's pretty small and doesn't carry much, but it holds me over until I can make a trip to the nearest Whole Foods on my way back from my skating lessons. With that said, all the employees in my little health food shop know me by name. I walk in and they pipe up "Hey Anna! How's it going today?" I'm a regular. I was thrilled to discover that they started carrying Sunwarrior protein powders a couple weeks ago. I had been DYING to try the brand (I've heard great things! ), and couldn't wait to get my hands on some! The employees graciously gave me about 5 sample packs so I wouldn't have to purchase the big container, just in case I didn't like it. But, as luck would have it--this stuff is great! It's really worth all the hype! And with a whopping 20 GRAMS of plant based protein per 100 calorie serving, this is the most protein-dense (per calorie) powder I've found. I've only tried the natural flavor, butI'm excited to try the vanilla as well (I'm not a chocolate gal). As a recipe developer, it's literally IMPOSSIBLE for me to eat anything without creating a recipe out of it. And it's even worse when I fet handed NEW PRODUCTS! It's play time! These Protein Power Balls are super yum and so quick to make. The ingredients are very flexible--I used what I had on hand, and you can absolutely do the same. Get creative! You really can't screw these guys up. Protein Power Balls; Vegan, Gluten-free. Serves one (makes about 5 balls). 1. 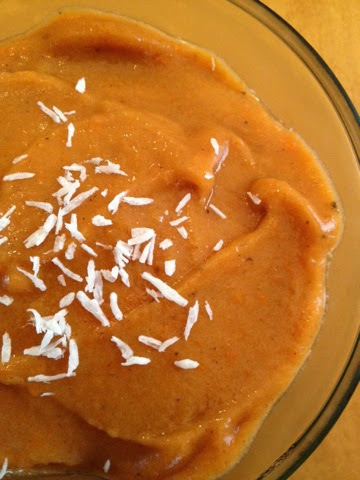 In medium size bowl, place 1/4 cup of the purée. Add the protein powder and mix. Add the rest of the purée along with stevia and cinnamon and mix well. 2. When throuougly mixed (should e consistency of "dough"), roll into balls, place in parchment lined plate and cover with foil. Freeze about 30 minutes. Let thaw about 5-10 minutes before eating. Enjoy! Sweet 'n Sour Mega Salad. Ok. Wow. Just, wow. This is by far and away THE BEST SALAD I HAVE EVER EATEN. And yes that is quite the statement. But I'm not kidding! It's the perfect combination of sweet, sour, crunchy, smooth, oh. YUMMO! 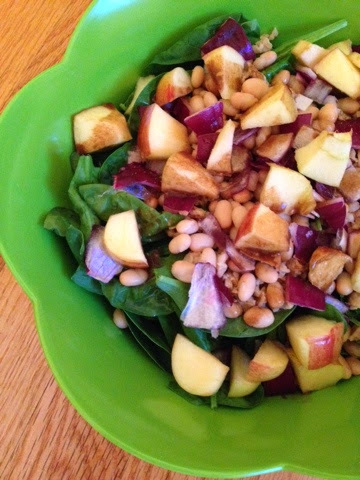 Sweet 'n Sour Mega Salad; Vegan, Gluten-free. Serves one (makes one "mega salad"). 1. Place spinach leaves in a LARGE bowl and add all ingredients in the order listed until you get to the balsamic. 2. In a small bowl, whisk the vinegar and Dijon together until smooth. Drizzle over salad and sprinkle with garlic and pepper. Enjoy! 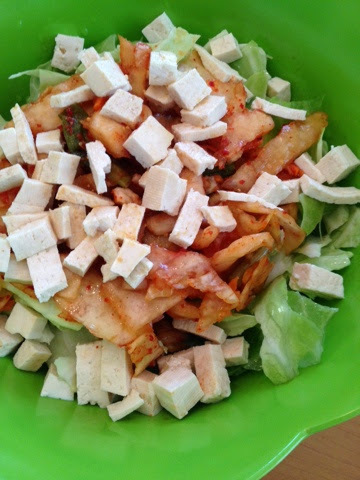 Krazy Krunchy Korean Kimchi Salad. Whoever can say this five times fast is totally talented...! What started out as a "clean out the fridge" salad quickly turned into another recipe creation! Super simple and quick, this is a perfect snack or Asian meal accompaniment. Enjoy! Krazy Krunchy Korean Salad; Vegan, Gluten-free. Serves one (makes one "mega salad"). 1. Add cabbage to a LARGE bowl. Too with kimchi, tofu, aminos, lemon, and I ginger. Enjoy! Ok...before you read turn our nose up at the sound of this, think about it. Creamy. Curry. Dip. Yes, yes. It's an unusual combo, but PEOPLE. You want to give this one a chance. Trust me! Serve with naan-style bread or pitas. Couldn't be yummier! 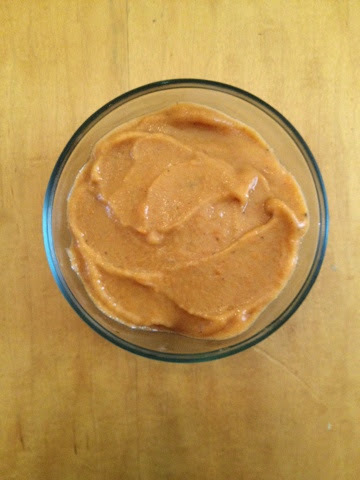 Creamy Curry Dip; Vegan, Gluten-free. Serves one. 1. Combine all ingredients in your mini food processor and blend until super smooth. Garnish with extra turmeric or curry and serve! Yummmm! As you all know, I love comkng up with weird food combinations. The weirder, the better, I always say! And, yes...this one is pretty weird! But so so so yummy. 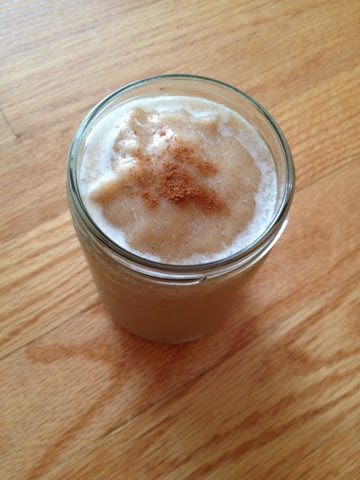 I made this for the first time when I got home from a sweaty skating practice--the absolute PERFECT refreshing and nourishing treat! Enjoy this frosty-it's a keeper! Frosty cool perfection right there. 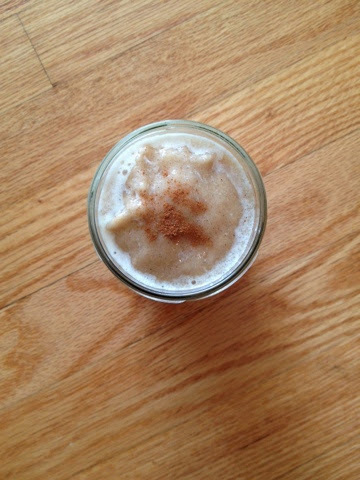 Cinnamint Frosty; Vegan, Gluten-free. Serves one. 1. Combine all ingredients in your vitamix or high speed blender and blend until smooth. This one is thick and frosty (hence the name! ), so you may want to eat it with a spoon. This is for all those diehard matcha lovers out there (myself included!). This is amazing. That is all I have to say. Yummmmmmmm. My fave way to eat: with flaxseeds!! Mmm. Matcha Nogurt; Vegan, Gluten-free. Serves one. 1. Make your Nogurt. In separate small bowl, whisk matcha powder with a bit of water until a thin paste. Add to food processor and blend! Serve as desired. 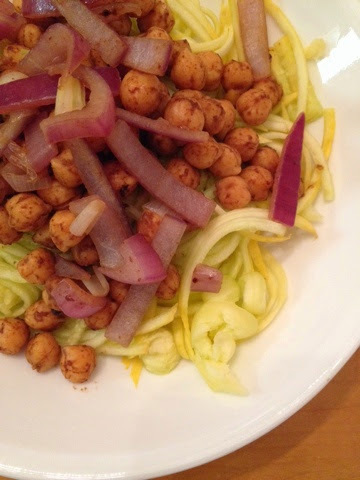 Raw Yellow Squash Noodles with Tangy Chickpeas. Yes, yes. The title of this one is preeeeeettyyy boring. Don't let the title fool you. This dish is AHMAZING! It literally takes 10 minutes but tastes like you slaved in the kitchen. Ready. Set. Go! Raw Yellow Squash with Tangy Chickpeas. 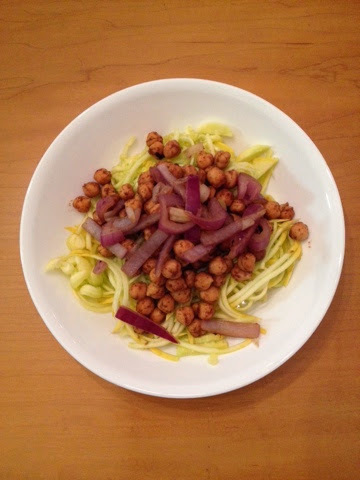 Raw Yellow Squash Noodles with Tangy Chickpeas; Vegan, Gluten-free. Serves one. 1. Make your veggie noodles and place in a large bowl. 2. Heat a nonstick pan over medium heat. Add chickpeas. 3. In a small bowl, whisk mustard and balsamic. Pour over chickpeas and let it sizzle. Mix aroun with spatula an cook until "toasty". Serve over noodles. 4. In same pan, after scraping as much glaze off as possible, add red onion with about 3 T water. Let it caramelize, stirring with spatula occasionally. Add garlic powder and cook until dry. Serve over chickpeas an noodles and enjoy! When I was younger (and ate ice cream! ), my ABSOLUTE FAVORITE FLAVOR was mint chocolate chip. There was NOTHING I loved more than a yummy mint chocolate chip ice cream on a hot summer day. Cool, rich, creamy, perfection. Ahhhhhhh. So refreshing. My fellow mint chocolate chip lovers, REJOICE! This "Mint-Carob Nice Cream" tastes EXACTLY LIKE THE REAL THING! Actually, no. IT'S BETTER! And it's so incredibly healthy! You have to make this...even if mint chocolate chip ice cream isn't your favorite, THIS FLAVOR WILL BE! It's definitely mine! You reaaaaaaalllly want to make this. Trust me! 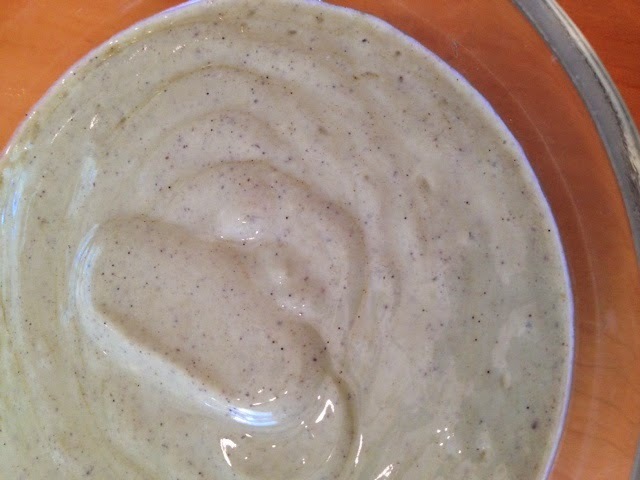 Mint-Carob Nice Cream; Vegan, Gluten-free. Serves one (makes one EXTRA LARGE serving!). 3. One peppermint tea bag, steeped in 1 cup boiling water and chilled in the fridge AT LEAST 48 hours for flavors to fully develop. 1. 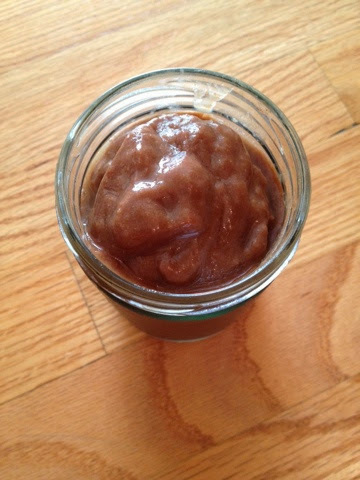 In your vitamix or other high speed blender, combine frozen nanas, carob, and 1/2 cup of your chilled peppermint tea. Secure lid and blend low to high. Of things are not moving, add another 1/4 cup of tea. Blend until smooth. 2. Turn off blender and set aside a shallow baking dish. Pour your nice cream into dish, making sure to spread it evenly about the dish. The consistency should be thick but easily spreadable...think very thick smoothie. Ok, I have to admit--I am so proud of how this turned out! It's so cute! And so much fun to make. 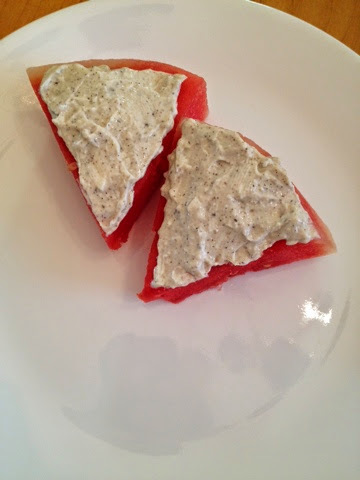 If you've for kiddos, this is a terrific recipe for them to help with! And you can all enjoy eating it afterwards...yum yum! Perfect summer time treat AND craft! 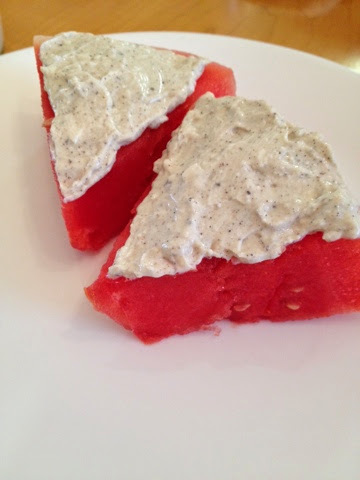 "Frosted" Watermelon Pie; Vegan, Gluten-free. Serves one. 1. 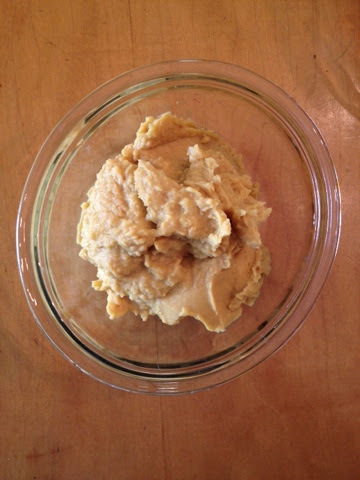 In your mini food processor, combine tofu, vanilla, and stevia. Blend until super smooth, scraping sides as you go of necessary. Transfer to a small bowl and let sit at room temperature for at least 10-15 minutes. 2. After frosting had set, simply spread on the watermon slices and enjoy! So easy and delish! As you all know by now, I love taking traditional dishes and not only giving them a vegan spin, but making them super un-traditional. I LOVE playing around with grain free dishes just for the fun of it! This "Skinny" Tabbouleh is quick and easy, packed with yummy fresh veggies, and delightfully flavorful. Perfect for a side salad of you don't want to use it like tabbouleh. Yum! 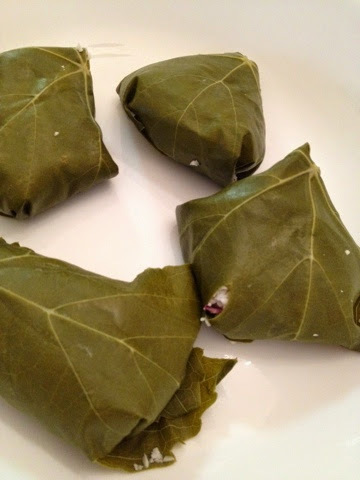 One of my fave ways to use this dish-stuffed grape leaves! Yummers. "Skinny" Tabbouleh; Vegan, Gluten-free. Serves one. 1. In your mini food processor, process cauliflower until "rice" consistency. 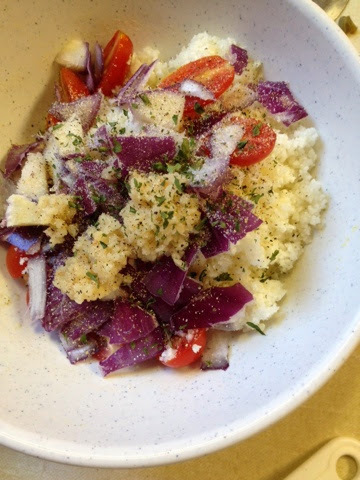 Transfer to medium size bowl and add remaining ingredients. Mix well and use as you wish! Ahhhh, summer is finally here. And you all know what that means...swimming, vacation, relaxing, and of course, frozen goodness! I used to LOVE those "Frosty" desserts that Wendy's used to serve. Of course, I haven't had one in YEARS (Like maybe 8 years?!) but I remember exactly how they taste, nonetheless! Cool, rich, and utterly satisfying, I have fond memories of summer nights eating these while watching the sunset...after a day at the pool of course! This veganized version of my all time fave is as close to the real thing as you can get. Give it a go! You will love it! 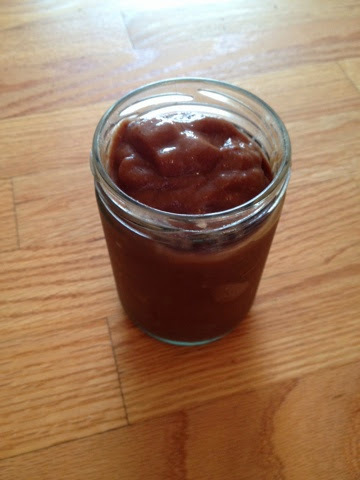 Copycat "Wendy's" Carob Frosty; Vegan, Gluten-free. Serves one. 1. 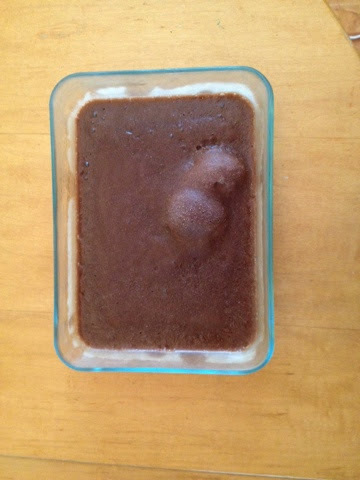 Place banana, pear, carob powder, almond milk, and 1/3 cup water in your vitamix or high speed blender. Blend slowly from low to high. While blender is running, add 1/8 cup water through the top. Use plunger to get things moving of necessary. 2. Blend until smooth. It will be thick--don't think smoothie, think more ice cream. Serve in a tall "frosty glass" and enjoy! 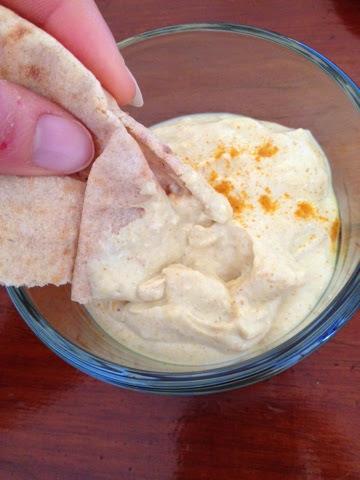 You can probably guess the main ingredient (other than chickpeas, of course) used in this hummus recipe. Yes, you guessed correct: my beloved nutritional yeast...or "nooch" as I like to call it. If you have never tried nutritional yeast, don't let the daunting name scare you. It's not like brewers yeast or dry yeast used in bakjng. Nutritional yeast is simply yellow yeast flakes that can be used however you wish. A couple of my favorite uses for nooch? Salad topper, my "Basic Cheeze Sauce" (recipe in a previous post), mixed with lemon juice for a salad dressing, you name it. Nooch is a vegans best friend. Not only does it TASTE EXACTLY LIKE CHEESE, but it is a SIGNIFICANT source of vitamin B-12, which many vegans happen to be deficient in. So if you haven't tried these amazing little yellow superheroes, you're seriously missing out. Go ahead and try it in this hummus! I guarantee you'll love it. 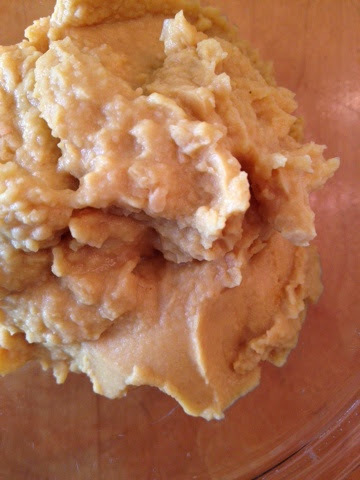 "Cheezy" Hummus; Vegan, Gluten-free. Serves one. 1. Just like all hummus recipes, this one is pretty foolproof. Just add all ingredients to your mini food processor and blend until smooth, adding splashes of water and scraping sides as needed. Serve with toast, veggies, or refrigerate to use for later...if you can refrain from eating all of it straight out of the food processor...! This is so good. It's so stupidly easy and so so SO good. It really reminds me of those yummy wraps you get at a real deli. Not subway--a REAL deli. So good. Hope you like it too! 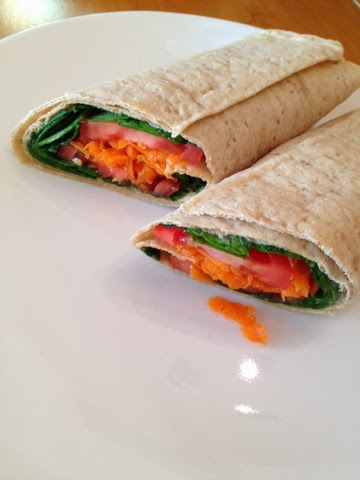 Deli-style Veggie Roll Up; Vegan, Gluten-free option. 1. 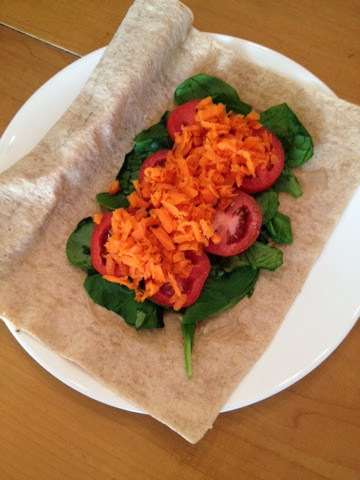 Lay out your wrap on a large plate. Add Dijon and spread evenly over wrap. Add spinach, then tomato, then grated carrots. Roll up tightly, slice in half, and enjoy! So good. I love playing around with protein powder. There are SO many things you can do with it it's unbelievable. This is one of my favorite uses for my beloved protein powder. 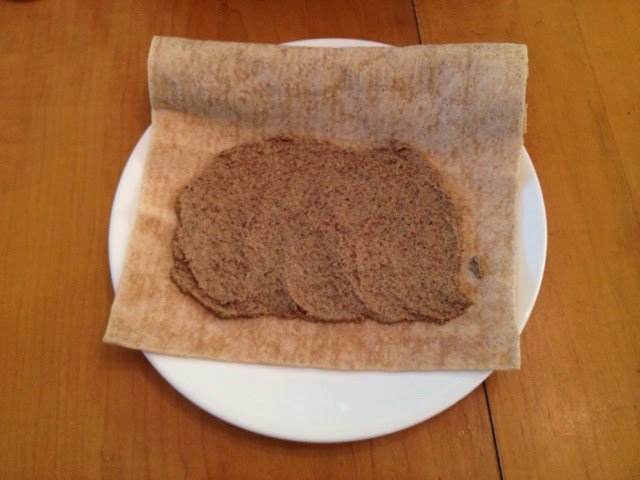 Super simple and ridiculously tasty, I like this stuffed in a wrap, spread in toast, as a condiment for veggies, and on top of oatmeal. 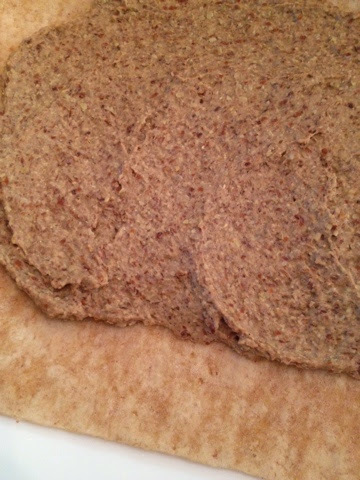 Protein-flax Spread; Vegan, Gluten-free. Serves one. 1. 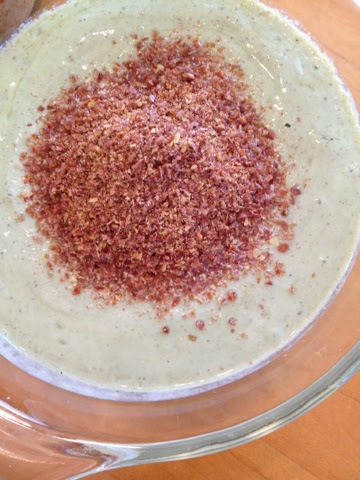 In a small bowl, whisk together the protein powder, flax, and stevia (if using). 2. Add a little water at a time as you stir. Keep stirring and adding water until you get a gooey "frosting" like spread. The amount of water varies with the brand of protein used. I've tried lots of different brands and the amount of water I need is never the same! 3. Use as desired! Yum. 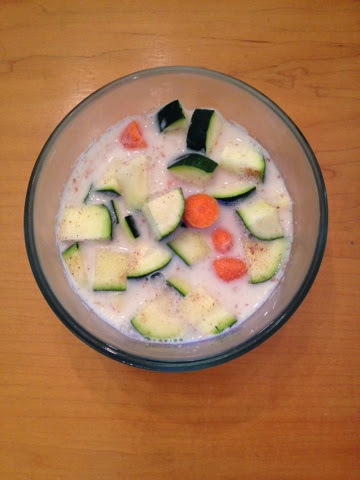 Raw Vegan Cinnamon-Coconut Veggie Cereal. If you follow me on Instagram, you already know that one of my favorite breakfasts is my "raw vegan cereals". Super quick and easy, filling, and LOADED with nutrients, it's definitely a go to breakfast (or lunch/dinner!) for me. 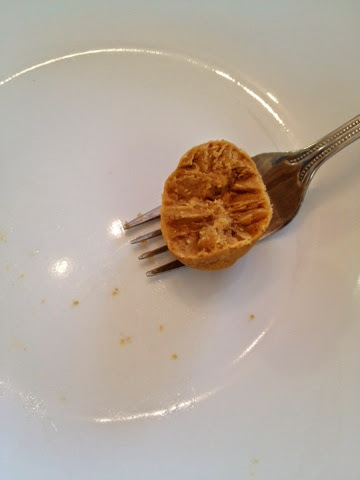 My bowls usually contain frozen fruit in addition to my veggies, but I was out of all my fruit on this particular morning! It was super good nonetheless. Because I did not have the sweetness of the fruit, I sweetened with stevia. Yummy! Hope you enjoy! Raw Vegan Cinnamon-Coconut Veggie Cereal; Vegan, Gluten-free. Serves one. 1. In a large bowl, place your chopped veggies and add cinnamon and stevia (both types). Mix with a spoon to distribute spices. 2. Pour almond milk over and serve!